Need a Roommate at Conference? NARHA's silent auction is always a fun-filled and high demand event of the NARHA National Conference and Annual Meeting and this year's promises to be no different. Proceeds from the silent auction help NARHA and the hosting region support safety and professionalism in the community of special people and equines who offer equine-assisted activities and therapies (EAAT). Download the Silent Auction form here or on NARHA's website. Use this form to donate to the silent auction or to donate items for the registration bags. Or give a form to someone you know who would love to donate to the cause of improving lives through equine-assisted activities and therapies. For information, questions or to make a donation, email Diane Eshelman, Sandy McMahon or Cher Smith. SPECIAL NOTE: NARHA will be putting together a good number of baskets for the auction. We need 11 for the region baskets and extra ones for some very special gift baskets. If you have baskets you'd like to donate to help us out, please contact Cher Smith. NRHA (the National Reining Horse Association) has invited NARHA and Central Kentucky Riding for Hope to participate in two demonstrations at the World Equestrian Games on Saturday, October 2, and Sunday, October 3, in the John Deere Reining Arena. NARHA and Central Kentucky Riding for Hope will show "the power of the horse of change lives" in this unique equine-assisted activities and therapies demonstration. The WEG plans to draw hundreds of thousands of people to the Kentucky Horse Park and projects October 2-3 to be two of the busiest days. These demonstrations guarantee to bring great exposure to the EAAT industry and the good work happening at NARHA centers. The World Equestrian Games are comprised of the world championships for eight equestrian sports. The Games are held every four years, two years prior to the Olympic Games, and are governed by the Fédération Equestre Internationale (FEI). We know that you are as excited as we are for the 2010 NARHA National Conference and Annual Meeting, sponsored by Purina! With so many fantastic sessions and workshops, the awards banquet on Saturday night and our beautiful state of Colorado, the National Conference is the premier event in the equine-assisted activities and therapies industry. We also know that the original conference registration deadline fell between paydays. Add the Labor Day holiday in the middle, and many people weren't able to get registered. But we want to make sure that everyone can get to Denver for this fabulous conference. So we have extended the early bird registration rate, but only for a few more days. Through September 30, members will still be able to register for $500 and non-members for $560. Then, October 1-18, members will be able to register for $600 and non-members for $660. After October 18, you will only be able to register at the door. Onsite registration will then be $675. That's a SAVINGS of almost $200 if you register now! The 2010 NARHA National Conference and Annual Meeting, presented by Purina, is November 3-6. Join us in Denver and help NARHA celebrate the innovation, hard work and spectacular accomplishments of the EAAT industry. Click here for hotel reservations. Click here to check out the conference web page and check back often to view conference updates as they're unveiled. This year's workshops and sessions at the 2010 NARHA National Conference, presented by Purina, promise to be outstanding. This year Amy Newman presents a workshop in the Practical Applications track, "Developing a Horse Maintenance Program." In this workshop, you will create a comprehensive horse maintenance program that reduces stress by learning how to evaluate the current condition of program horses, develop a fitness and/or behavior management protocol and match horses to riders. 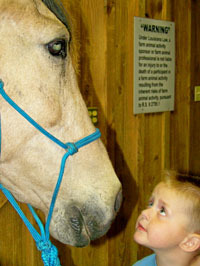 Amy has worked in the equine-assisted activities and therapies industry since 1995. She is a NARHA Certified Master Level Instructor, a site visitor and evaluator and the head instructor of a riding facility. For all the scheduled sessions, see the online registration book. Need a Roommate for the Conference? There has recently been a large addition to the rooming list for the conference. If you are interested in sharing a room with someone, please check the roommate list. Congratulations to NARHA's riding certification candidates on your accomplishments thus far. NARHA certification takes work and determination to achieve and we commend you for making this goal a priority and working hard to achieve it. NARHA is implementing a new procedure, effective November 1, 2010, that addresses the situations in which a candidate planning to attend a certification does not have an Instructor in Training (IT) letter in hand at the time of the certification. NARHA has long had a procedure that required all certification candidates to have an IT letter and produce it for the center hosting the certification test 32 days in advance of the certification they plan to attend. The NARHA office does not rush an IT letter to any candidate nor can we email an IT letter directly to a center. Should a candidate sign up for a certification without the requirements in hand, he/she risks not completing the requirements, thus being unable to test and the possibility of losing the certification fee. Please remember to confirm the host site's refund policy in case you do not receive your IT letter in time for the certification. If any candidate chooses to test without an IT letter the candidates and host sites should be aware of the following processing fees that will be assessed effective November 1, 2010, by the NARHA office prior to his/her certification being issued. 1. If the candidate does not have an IT letter by the time the candidate presents him/herself for certification testing and the evaluator allows the candidate to test because they have reviewed the candidate's paperwork and feel the candidate has completed the required materials and can move forward, the candidate will be invoiced an additional processing fee of $150 to be paid to the NARHA office prior to his/her certification results being released. 2. A fee will also be assessed to the host site of $75 per candidate who tested without an IT letter. Ultimately, it is every candidate's responsibility to ensure all requirements have been met by the appropriate deadlines and that his/her IT letter is in hand in order to test for certification. All candidates who have signed up to test for certification are emailed about 30 days prior to their selected certification by the NARHA office with an update on their status as it relates to their IT letter. If the candidate is missing an item and does not have an IT letter in hand, he/she is notified. If you have any questions, please feel free to call us at (800) 369-7433. Kelly Sullivan (ext. 104) or Tara McChesney (ext. 114) are happy to assist you in your certification process. Good luck in achieving NARHA certification! You can also download this notification from the website. Three NARHA subcommittees are seeking enthusiastic new members to join the committees. To download a full description and information on how to apply, click on the links below. Join one of these committees and help make a difference in your membership organization! Register today for the CHA International Conference at The Oaks Equestrian Center in Lake City, Florida, just outside of Jacksonville October 21 - 24, 2010. With Olympian David O'Connor, Combined Driving Guru Chester Weber, Dale Myler of Myler Bits, Julie Goodnight from HorseMaster TV, Daniel Stewart of USET, Karen Murdock trick trainer, Mitzi Summers, Teresa Kackert, Heidi Potter, Dawn Samuelson from Through the Horses Eyes and vets, dentists, chiropractors, trail experts and more - this is an event you do not want to miss! And you can ride great school horses with these experts! Check out the full schedule of speakers and topics here. You and your horses will benefit greatly by your attendance. Click here for more details. Dr. Laura Trask, a clinical psychologist in Los Angeles, CA, will be on the Dr. Phil show September 24, 4 p.m. Pacific Daylight Time, on CBS. Trask is an equine-facilitated psychotherapist and will be talking about the benefits of of EAAT to improve the lives and mental health of individuals, families and groups worldwide. For information on Dr. Trask, visit www.drlauratrask.com. Unless otherwise noted, contact Tara McChesney at 800-369-7433, ext. 114, or tmcchesney@narha.org for further information. All dates are subject to change. Please visit the NARHA calendar for a list of 2010 registered on-site workshops and certifications. Please note the list is not complete, there will be more NARHA Registered OSWC events added in 2010. Please direct correspondence about this newsletter to NARHA News coordinator. NARHA News is a benefit of NARHA membership. No portion of this publication may be reproduced by any mechanical, photographic, scanned or electronic process without written permission from NARHA. NARHA reserves the right to reject, accept and edit submitted material. NARHA News is intended as an information exchange and an opportunity for communication for members in the field of equine assisted activities. The opinions, practices or products presented in NARHA News do not necessarily reflect NARHA policy, imply NARHA endorsementor comply with NARHA standards.